Home CDN , children , crafts , feature , holiday , holidays , homeschool , January , papercrafts , printables , US , worldwide January 25th - Featuring Macintosh Computer Freebies! January 25th - Featuring Macintosh Computer Freebies! 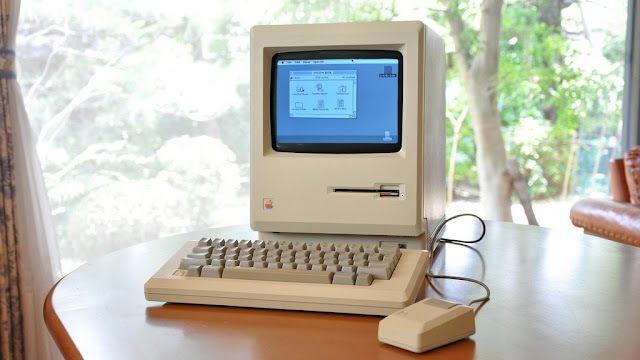 -- Named after the McIntosh variety of apple, the original Macintosh computer was released by Apple Inc. in 1984. Using a graphical user interface and mouse instead of the then-standard command line interface, the Mac garnered an immediate, enthusiastic following. However, many software developers shied away from the challenge of rewriting command-driven programs, and there was little software initially available for the new system. -- Back in the early 1980s, word spread about an inviting little personal computer using something called a mouse and smiled at you when you turned it on. Steven Levy relates his first encounter with the pre-released Mac and goes on to chronicle the machine Apple developers hoped would make a dent in the universe. A wonderful story told by a terrific writer. Levy was the longtime writer of the popular Iconoclast column in MacWorld; he's now a columnist with Newsweek, the birth and first ten years of the Macintosh is a great read. • Apple Macintosh Computer Patent Art -- Official US Patent Art Print - Apple Macintosh. Quality reproduction prints of the original patent filed by inventor Steve Jobs in 1986. Each patent sheet is printed on 24lb ivory 8.5" by 11" antiqued parchment paper which looks phenomenal with or without a frame. Framing this item makes it into a very unique, simple, and affordable gift which really makes a statement. • Steve Jobs Patent Prints -- The perfect gift for the hard to buy for collector or the centerpiece for your Home, Garage or Man Cave. These Steve Jobs Apple Patent Print Posters measures 8" X 10" Unframed - (including a white border) and is printed on 45lb. archival safe, fine art paper. (The use of new archival technologies means these prints are designed to last for decades). A truly unique keepsake gift. - Opposite Day is a topsy, turvy day when everything you say, do, see, and hear are the opposite. If you say go left, you mean go right. If you say look up, it means to look down. If you see your left foot... is it really your right? - Years ago, it was the thing to do – fluoride dental treatments for the kids. Later came fluoride toothpaste and cities were told water fluoridation would benefit citizens. Now some are questioning this practice. - Virginia Woolf's 1928 essay A Room of One's Own was likely the inspiration behind A Room Of One's Own Day. A time to appreciate the joy of having your own room to duck into when you're tired, relaxed, or want to avoid family members. If you don't have your own room, spend today fantasizing about what it would feel like to not have to share a room with the person/people/animals/aliens you currently live with. - One Hundred and One Dalmatians, often abbreviated as 101 Dalmatians, is a 1961 American animated film produced by Walt Disney, based on the novel The Hundred and One Dalmatians by Dodie Smith. The plot centers on the fate of the kidnapped puppies of Pongo and Perdita. - Nellie Bly was the pseudonym of Elizabeth Cochrane Seaman, a New York journalist whose muckraking made her a 19th-century celebrity. A victim of personal hardship growing up, she specialized in stories of the downtrodden, especially indigent women and children. She kicked up dust as the voice of the powerless in Joseph Pulitzer's New York World and became nationally known for reporting on rotten workplace conditions and government corruption. Her national celebrity reached its peak in 1890, after a 72-day trip around the world, a public relations challenge to the character Phileas Fogg from Jules Verne's Around the World in Eighty Days. - To appreciate the great taste of a world famous alcoholic coffee called An Irish Coffee. If you've never had it before, give it a try. Let today be the day you try this popular drink.